In the lead up to Words & Women 2013 we will be posting profiles of the readers, performers and artists who will be contributing to our events on International Women’s Day. The first is Megan who will be reading in the evening in the Fusion Digital Gallery. Megan is the current Charles Pick Fellow at the University of East Anglia. She graduated from UEA with a BA in English Literature and Creative Writing in 2004 and MA in Creative Writing Prose in 2005. Since when, besides pursuing her own writing, she has worked as an editorial reader and creative writing mentor. - An art exhibition in The Forum Atrium by local women artists. - A reading by older women writers in the Fusion Digital Gallery with compere, short theatre, music and wine. - And a tour of this reading as part of The Breckland Literary festival. More details will follow as we confirm names and times. But already speclal thanks to The Forum Trust Limited (www.theforumnorwich.co.uk) for agreeing to house the art exhibition and the evening read. The logos for Words And Women have been designed by Rose Cowan who is studying for the Illustration BA at Norwich University College of the Arts. Rose’s work can be seen at http://rosealison.tumblr.com. Her papercuts have been shown at the Glasgow Art Fair and at Temple Newsam House, Leeds. Hello! Welcome to Words And Women. We will be using this blog to keep you updated on our planned celebrations for International Women’s Day 8th March 2013 in Norwich. 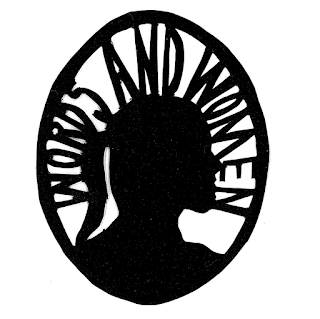 Words and Women was started in 2011 by Bel Greenwood, journalist, scriptwriter and founder of The Greenword Tree (www.thegreenwordtree.co.uk) which organizes imaginative experiences for children and young people. 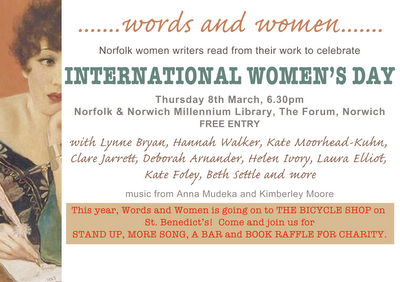 Bel couldn’t find any events in Norwich celebrating International Women’s Day and so decided to create one of her own, bringing together a group of local women writers – some established, some not – and singer songwriters, and arranging for them - with the help of librarian Gwen Parker - to perform their work at the Norfolk and Norwich Millennium Library. The event drew a big appreciative audience of men and women, and Bel was able to use it to raise money for Camfed, a charity which helps to educate young women in Africa out of poverty. Bel was joined in 2012 by Lynne Bryan (www.lynnebryan.co.uk), novelist, short story writer and teacher of creative writing, and together they expanded the event to include cabaret and stand-up at The Bicycle Shop on St Benedicts Street, Norwich. Money was raised by a book raffle and proceeds went to Camfed and also Leeway, which provides women and children with shelter from domestic abuse. Below is our fantastic poster designed by Kate Munro (www.katemunro.co.uk) for that event. Now, Bel and Lynne are organizing the 2013 event which promises to be much larger but, hopefully, just as much fun.